Everybody needs a little cheering up sometimes! We’re quite sure with our all-new Cheer Me Up Bouquet an instant smile will be created. 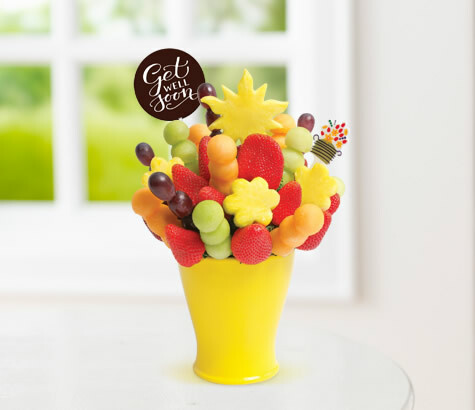 This endearing fruit bouquet includes Sun-shaped pineapple, strawberries, honeydew, cantaloupe, and grapes artfully arranged in a cute ceramic container with a "Get Well" Belgian Chocolate Pop on top. Cheerful? We think so! Container may vary.